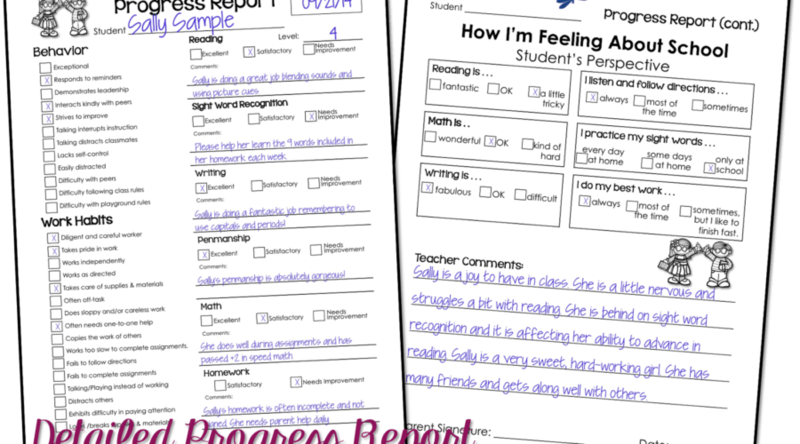 Progress Reports – Quick and Easy and FREE! It’s hard to believe that it is already time for progress reports! This year we are holding parent-teacher conferences a little earlier than usual. I’m glad about that. It really helps to try to nip a few things as early as possible. But it also means a lot of work to get things ready. Progress reports for 30 kiddos can be time-consuming! Previously, I’ve shared my progress report. Since then, I’ve been asked numerous times for one that could be completed digitally. It is a PowerPoint document. I’ve used KG I Need a Font for adding student information. However, you can use the font of your choice. Also, I used blue for the “fill in” color for the image above, but it is set to use black to be printer and copier friendly. Likewise, you can change it to any color you want. If you’d rather not type up a progress report for each child, you can just print it and make copies for each student and write in all of the info by hand. This FREEBIE is available in our subscriber freebie file. If you aren’t a subscriber yet, you can grab Grab the Digital Progress Reports here! This is a wonderful way to inform parents on their child's progress. I especially like that the student has a way to assess their own learning. Thanks. Is this resource available in your store? I am not on FB (I know, crazy, right?! ), but I would love to be able to use this for our conferences in November. Would you be able to send this to me? I would really, really appreciate it! Traci, I've tried three times to go to the fan freebies on your site, but it doesn't load it, even though I follow your site. Any suggestions? I used your progress report during parent conferences last week. It was a great tool to have. Parents especially enjoyed seeing what their child had to say (student section). Thanks! I used these for first quarter progress reports and LOVED them. So did my parents. 🙂 Do you have anything similar for report cards?